Pastors Oral & Everine Hazell invites you to our “When Women Worship . . . We Reap the Harvest” Conference. Services begin, Tuesday, April 25 thru Thursday, April 27th, 2017, 7:30 pm at Global Life Church. No registration Fee! One Day Session on Wednesday, April 26, 2017, begins 11:45am: includes free lunch; health tips and gift exchange (bring a gift for a woman & receive a gift). On Thursday, there will be a night of Worship featuring Pastor Keri Fraser. 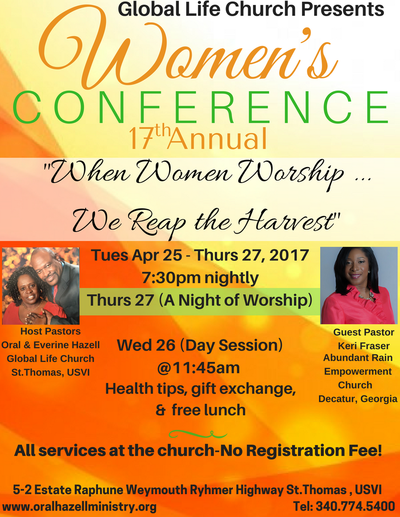 The Guest Speaker will be Pastor Keri Fraser of Abundant Rain Empowerment Church in Decatur, Georgia. 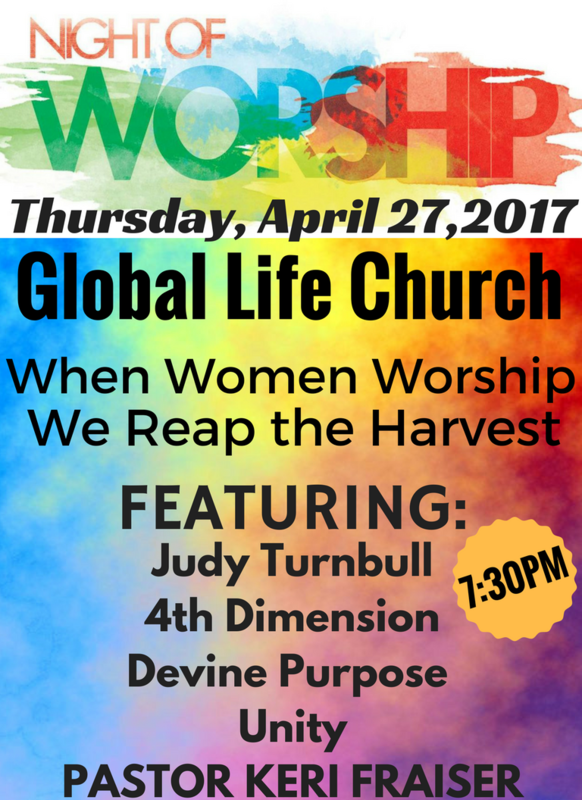 All services will be held at Global Life Church; 5-2 Estate Raphune, along the Weymouth Rhymer Highway, St.Thomas, United States Virgin Islands. Come and join us with an expectation of receiving the Supernatural outpouring of the Holy Ghost. At this conference the entire family is welcome. YOU CAN REGISTER FOR THE CONFERENCE HERE - IT'S FREE! REGISTER ,SO THAT, WE CAN PREPARE FOR YOU.